NEW YORK — Immigration officials arrested 41 undocumented people last week in the New York City area, 38 of whom had criminal convictions, including residents from the North Shore of Staten Island, Bushwick and Elmhurst, according to the U.S. Immigration and Customs Enforcement and advocates. 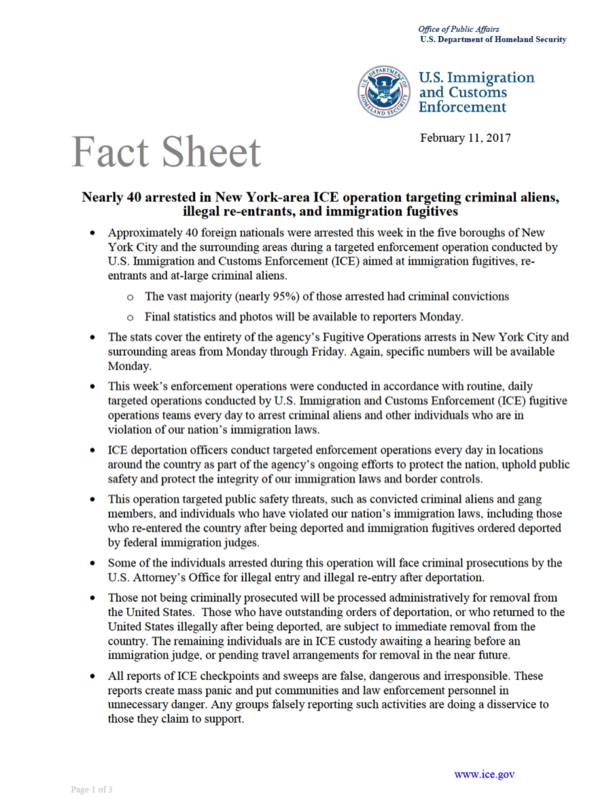 The raids were part of "routine, daily targeted operations to arrest criminal aliens and other individuals who are in violation of our nation's immigration laws," according to a Feb. 11 memo leaked to New York Immigration Coalition over the weekend. On Monday ICE confirmed some of the details in the memo, adding that the arrests included a self-professed gang member from El Salvadoran gang member with an assault conviction and a Jamaican and a Mexican with first degree sexual assault convictions against children under the age of 11. The agency didn't release any further details on the other 38 people cuffed between Monday and Friday last week and no further information on the three people who'd been arrested with no criminal convictions. When describing the week-long sweep nationwide where they arrested 680 people in total, the agency said, "75 percent were criminal aliens, convicted of crimes including, but not limited to, homicide, aggravated sexual abuse, sexual assault of a minor, lewd and lascivious acts with a child, indecent liberties with a minor, drug trafficking, battery, assault, DUI and weapons charges." Last week's raids in the New York area detained fewer people than a sweep last August targeting 58 people with felony convictions, a history of gang activity or multiple misdemeanor convictions, according to ICE. President Donald Trump's Jan. 25 executive order greatly expanded undocumented immigrants who can be targeted by the agency to include people who've been charged with crimes but not convicted, people who are suspected of criminal activity but not charged, and those charged with misdemeanors. It's not immediately clear if last week's arrests included people under those broadened standards. Still, there's a heightened sense of fear within immigrant communities because of the way Trump talked about immigration on the campaign trail, advocates said. By Saturday, rumors of raids had spread like wildfire among immigrants in neighborhoods like Bushwick, Jackson Heights and Corona. "[It's] freaking everybody out," said Rob Solano, director of Churches United for Fair Housing, a religious network that serves mostly immigrants in Brooklyn and has organized emergency "Know Your Rights" clinics in network churches. "There is a fear of being taken and not doing something wrong." Advocates with different immigrants-rights groups had information on seven cases of New York City residents arrested as of Monday, but declined to release their names or any details on the reason for their arrests. The group Make the Road New York said it's been in contact with the families of five Staten Island residents who were detained by ICE officials this week on the North Shore and Mid-Island, according to spokesman Daniel Altschuler, who declined to provide more information about their cases. The organization also confirmed one detention in Elmhurst, Altschuler said. Immigrant Defense Project lawyer Genia Blaser said she knew of one arrest that took place in Bushwick. A 30-year-old man from Puebla, Mexico, was arrested in the pre-dawn hours on Wednesday morning, said Blaser, who'd been contacted by the man's girlfriend and brother following his detainment. Blaser said that the man had been deported 10 years ago following a criminal conviction and had re-entered the New York City area five years ago. He'd been working in retail, she added. The man's girlfriend and brother couldn't immediately be reached immediately for comment. The NYPD referred calls for comment to ICE. The mayor's office said it had received "credible reports" from the New York Immigration Coalition. "The Mayor is closely monitoring the situation and the administration is working with NYPD and community organizations to verify the activity as we receive reports," spokeswoman Rosemary Boeglin said. We will use all of the tools at our disposal to protect them from any federal overreach. Advocates at the New York Immigration Coalition urged New Yorkers to educate themselves on what their rights are when it comes to dealing with ICE. "They have a right to remain silent. They have a right to ask for a lawyer. They should not sign anything," said Thanu Yakupitiyage, a spokeswoman for the coalition. "If it's in their home, they don't have to open the door." The Immigrant Defense Project has a hotline immigrants who have issues with law enforcement at 212-725-6422 and the State's Office for New Americans has a hotline for immigration issues of all kinds: 1-800-566-7636.